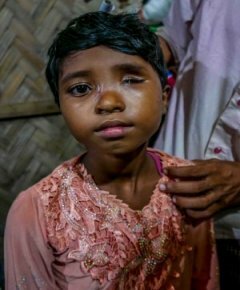 Since August 2017, over 620,000 Rohingya refugees from Myanmar have crossed the border to escape violence there. 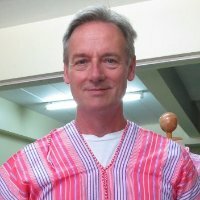 Ian Cross is a doctor working with Médecins Sans Frontières (MSF) in a health clinic treating refugees. In Love is all you need, he shares the story of a very special patient. Here he shares the story of two little girls. She didn't see the soldier who fired the shot. Her father was running from the village carrying her in his arms. Her arms were around his neck. The bullet smashed through her right forearm and entered her father's head, killing him instantly. She didn't talk much about what happened next. She crossed the border into Bangladesh with her mother and little brother. 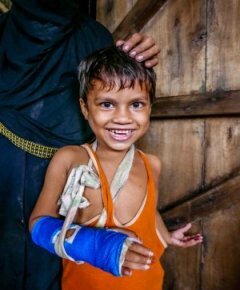 "She asked us to tell the world what had happened to her daughter"
Her arm was too badly damaged for us to treat in our facility at Kutupalong, so we referred her to the Memorial Christian Hospital, a couple of hours away to the north. The surgeons began by fixing the forearm bones. I reviewed her when she returned to the clinic with her arm in a cast. She couldn't stretch out her fingers because the extensor tendons in her forearm had been destroyed by the bullet. After a month or so, she was ready for further surgery to reconstruct the tendons. She came to the clinic this morning, proud to show me the result. She could wiggle her fingers. She was delighted. Her mother was so grateful for the treatment she received that she asked us to tell the world what had happened to her daughter. "Although she was unfortunate to have been shot, she was incredibly lucky to survive"
How can you be shot through the eye and remain alive? This little girl didn't see who shot her either. The bullet entered her skull obliquely, in front of her right ear. The bullet traversed her eyeball and exited through the side of her nose. The eye was completely destroyed of course. The surgeons repaired a hole an inch across between her eye socket and the brain. The sight in her left eye is normal. Although she was unfortunate to have been shot, she was incredibly lucky to survive. 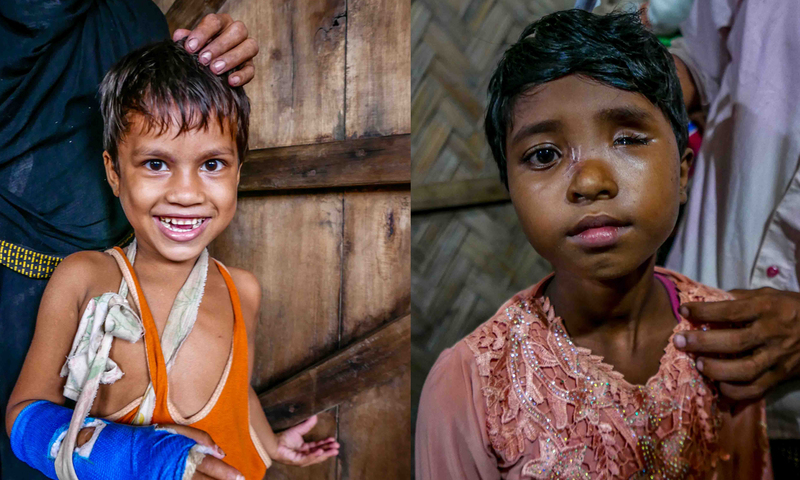 These two little girls managed to reach Bangladesh and received excellent care. But how many more died before they were able to leave Myanmar?